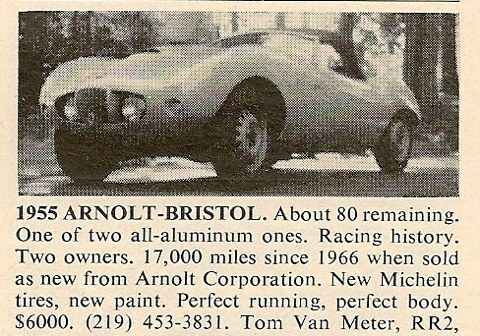 The latest Classified Ads from the Past is a rare all-aluminum 1955 Arnolt-Bristol offered for sale in the pages of Road & Track in 1972 for $6,000. The story of the Arnolt-Bristol is a short lived, but incredibly wild venture. The man behind the beautiful Arnolt-Bristol cars started out as a mechanical engineer in the Midwest United States before the second World War. When the company he worked for in 1939 went under, Stanley Harold Arnolt purchased the patents for a small outboard marine engine for mere pennies, and in a few years transformed it into millions of dollars when the Navy needed such a motor for their small water craft during World War II. This was the beginning of an empire for S. H. Arnolt, also widely known as “Wacky” Arnolt, who post-war would branch out into dozens of companies, several of which were automotive-based. Arnolt’s passion for sports cars began in 1949 when he purchased an MG T.C. He was so smitten with the little British roadster that he went to his bankers and borrowed a million dollars to establish S.H. Arnolt, Inc. at 153 East Ohio Street, Chicago, Illinois, with the money going to procuring 1000 Morris Minors for his newly-established Chicago dealership. Wacky, however, was still not content with the fact that he virtually exploded onto the auto scene as a prime time player practically overnight. Arnolt set his sights on becoming an auto manufacturer, and after a visit to the Turin Auto Show in 1952, he walked away owning a large portion of Nuccio Bertone’s company that was showing off two MG chassis with hand-crafted Bertone bodywork. Bertone was going broke, and Arnolt was more than glad to assist the small Italian coach builder to return to operating in the black. With Bertone in his pocket, Wacky went to England and visited Bristol Cars. At the time, he had his eye on the 404, a sleek coupe built on a 96-inch wheelbase. Bristol was using the pushrod 2-liter six of BMW origin that the English company won the rights to as part of war reparations. These engines, complete with four-speed gear boxes, were mounted to the chassis and shipped to Bertone’s factory in Italy for body fitting. Bertone delivered by crafting a fluid-like form in steel with aluminum hood and deck lid. Lacking any embellishments, the body of the Arnolt-Bristol gives one the sense that the vehicle is traveling at high speed, even when sitting stationary. The Bristol engine was rated at 130HP, and gave the 1800lb car the ability to reach 60 mph in just over 8 seconds, quite sporting in its day. The aluminum-bodied cars, of which five were produced, were used primarily for racing efforts, with three cars being retained by the Arnolt factory and campaigned at Sebring, achieving a 1-2-4 finish in the two-liter class in 1955 and 1956. Arnolt’s passion for building and racing sports cars ran out in 1957, when late in the 12 Hours Race at Sebring, Bob Golditch was killed when the Arnolt-Bristol he was co-driving with S.H. Arnolt braked too late going into a corner and flipped over. The loss of his teammate, and the fact that none of the cars sold up to that point made a profit, caused Wacky to begin to back away from the Arnolt-Bristol venture. In 1960, Wacky gave Walt Inai and Juan Lopez permission to take two cars to Sebring. Drivers Max Goldman and Ralph Durbin won the two-liter class, and campaigned in a total of nine races that year, with six first place finishes. Out of the 142 Arnolt-Bristols produced, twelve were lost in a fire, and the remaining 130 were sold between 1954 and 1963, with Arnolt losing money on each sale. Five of the cars were bodied in aluminum, and two were constructed as coupes. Today, nearly 90 of the original 130 cars have been accounted for and continue to cause a stir at Concours events and vintage race meetings the world over. The history of this truly global sports car speaks for itself in terms of performance, and with the car featured in the ad from Road & Track’s May 1972 issue being one of the five aluminum-bodied cars, a little rarity will never hurt resale value either. I am fascinated by the Arnolt cars, but am equally fascinated by the MG-Arnolt. These are great small bore touring sports cars, with the beauty of a Bertone handcrafted Italian body over the classic MG T series chassis. For those of us who are fans of both British and Italian small bore classic cars, and love a classic style little connoisseur car, the MG Arnolt is fantastic, but information about them is very hard to find. Any info, on prices, number of surviving cars, cars for sale (and I prefer folks who are truly interested in the car, not speculator collectors or auction houses only in it for the profits) The MG Arnolt is a beautiful classy little piece of work that deserves to be preserved. I have had several Arnolts. I am aware that 5 coupes were made, but I only know of 2(possibly 3) alloy cars. One was left hand drive and one(possibly 2) right hand drive. Can I ask your source? The right hand drive was decided for racing as Arnolts lift the right rear wheel in right turns and lose traction. With a driver’s weight on that side the wheel would keep contact. Arnolts need limited slip. I understood that the Aluminum had to be so thick there was no real weight savings in these cars. My source for much of the information regarding the Arnolt Bristol article was an article entitled “Wacky” Arnolt and his Wonderful Bristols” from the August 1978 issue of Car Classics magazine. The article was written and photographed by Rich Taylor and spanned from page 42 through to page 45 of the issue. The article states that three coupes were constructed (chassis numbers 404X3120, 404X3122, and 404X3123), however only two were known to have existed. Taylor also states that chassis numbers 404X3136-404X3140 (5 cars) were given all-aluminum bodies and large capacity fuel tanks, with chassis numbers 404X3138, 404X3046, 404X3136, and 404X3140 being retained by the factory as race cars. Thank you for your interesting insight on the right hand drive and the need for a limited slip differential. Very interesting to know. In the fall of 1962 my highschool buddy R. Girvin bought a ’55 A-B from ??? in St Louis Mo. Our group of 5 h.s. guys frequently would double-date, caravan style with my parent’s V.W., other guy’s parent’s ’59 190S M-B 4-door sedan, Girvin’s robin’s egg blue (repaint?) A-B going to the drive-in HoJo’s, Shakey’s hamburger or Steak-n-Shake all on Manchester Rd. in Kirkwood, Mo. One night when stopped for a red light, Rick’s date Kriste, while looking at the dash, noting the clock timer turn signal switch, the other switches etc…. asked “what’s this do as she punched the RED STARTER BUTTON!!! We subsequently parked the A-B on any incline available so we could start it while rolling down hill in 3rd gear including his parent’s driveway which sloped towards the garage… Eventually Rick scraped together enough $$ to have the starter replaced. In June ’63 Rick and I with our parents’ consent headed off to Elkhart lake Wi. for the JUNE Sprints. We had many adventures along the way including being in traffic just beyond the tech inspection garage in front of Roger Penske driving the still unpainted -bare aluminum- Zerox Antifreeze Special- Cooper Monaco w/?chev v-8 power….. I wanted to add a bit about the AB. I was the owner that the above article mentioned. I always wondered how the starter actually got broken….Now I know..Hmmmm !! It was a real treat to drive even in Missouri Winters with no top. It was such a fun car to drive and I was lucky enough to have owned in in my JR & SR year of High school. I bought the car through Boatman’s Bank in St Louis and i think I only paid around $800.00 for the car. My Dad told me if I wanted it I had to figure out a way to do it…. I had my sister co-sign the loan and made payments for one year. I was very proud of my achievement and the car. We had a lot of fun in it and driving it all around. The trip up Elkhart Lake was trippy and we did have fun, I remember that was the year the the Cobra was beating Corvettes most of the time. and seeing all the cars was a wonderful experience for us young sports car kids…We have all moved on and I still have a place in my heart for the old Arnolt Bristol!! One of the joys of writing for Sports Car Digest is to be able to hear the stories of those who owned, drove, and or raced these machines back in the day. there has been one sitting in Pound Ridge NY since I was a kid in the 60’s. Sad to see it just sit there, I live in Fl and would love to have it. The AB’s were built as a rolling chassis in the UK, then shipped to Italy for the Bertone body, then shipped to Warsaw, IN for final assembly. There was a showroom in Warsaw, where as a kid I got to crawl around the AB’s.